William G. Zonnebelt, died April 14, 2019 at the age of 92. He is now at home in heaven with his Lord and Savior. William ("Bill") Zonnebelt was born in Grand Rapids, MI on August 18, 1926 and spent his infancy and early childhood living with his parents in relatives' homes in Michigan because of the impact the 1929 Depression had on his parents when they "lost" their home. When things improved financially they rented other houses but his parents never owned their own home again until Bill was an adult. By the time he was 12 or 13 he was working and living at the Holland State Park during the summers, working there with conservation officers. When he turned 16 he was able to work as a beach life guard which he loved doing. A young lady in his class at school named Norma Albers would frequently sun herself in close proximity to the life guard stand and they soon began dating. 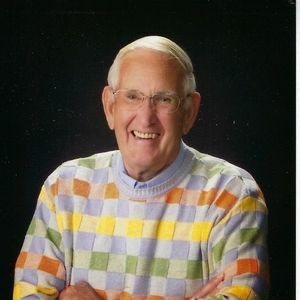 Bill graduated from Holland High School in 1944 and attended Muskegon Business College after World War II. Upon graduation from Holland High School in 1944, Bill immediately enlisted in the Navy out of his intense patriotism for the USA and what was "right." He actively served for 2 years until World War II ended, followed by re-enlisting for an additional 4 years in the reserves. Once he finished his basic training, and before going on his first sea duty, he came home on leave and on November 11, 1944 asked Norma to marry him when he returned. He then shipped out on the "Saugus" (a 455 foot ship) in the amphibious warfare division. He was a coxswain on one of the thirteen 36 foot Higgins boats on their ship and also a part-time helmsman. Among other things, his division brought occupation forces (mostly Marines) and supplies to Okinawa, Saipan and several other islands in the Pacific. They also transported the wounded to hospitals (mostly in Hawaii). After being discharged from active service at the end of the war, he worked a brief time as a conservation officer. However, once married, his father-in-law rather quickly offered him a job at the Marvin Albers Company in Holland before Bill could take his daughter to a distance forest somewhere. Bill worked faithfully for his father-in-law who was like a dad to him, later bought the wholesale company which was by then primarily supplying paper and cleaning supplies with his valued partner, Roger Kleis. They eventually sold the business in 1988 after working and running it for 40 years and retired at the age of 62. He continued to be deeply involved in the ministry of Trinity Reformed Church upon retirement where he had been a member since the age of 5. He served on the consistory and several church committees through the years. He and Norma purchased a condo and a new boat in Pentwater, MI in 1991 where they spent most of their summers enjoying salmon fishing, traveling by boat to various Michigan ports, especially Mackinac Island, entertaining, and enjoying the lake breezes and magnificent sunsets. He served on the Spinnaker Condo Board for 6 years as well. In 2008 Norma's health deteriorated to the point that they sold their home in Holland, MI and moved in with their daughter Susan and husband Bob, in Jenison, MI where they lived together for over three years. The past 7 years they have lived 6 months in Pentwater and 6 months in Marietta, GA with Susan and Bob, very near to Bill's granddaughter, Sarah, her husband, and his three great-grandchildren. He found so much joy in sharing life with them! He loved his full and stimulating life with the family and often said he felt so blessed! Bill has been preceded in death in 2008 by his loving wife, Norma Albers, after 65 years of a great marriage; his son, Dr. Steve Zonnebelt, who died at the age of 33 in a plane crash on Beaver Island; his first son-in-law, Rick Smeenge, at the age of 46; his sister, Mary Jane Van Oosterhout; and his brother-in-law, Dr. Bob Albers. He is survived by his loving daughter, Susan, and son-in-law, Bob DeVries; special granddaughter, Sarah Byrd, and husband, Chris, and his 3 great-grandchildren, Caleb, Zoe, and Wyatt. He is also survived by 3 step-grandchidren and spouses, Brian and Dawn DeVries, Christy and Todd Hultink with children Hannah and Sophie, and Carrie and Joe Griffin with children Elliot, Hayden, Oliver, and Jordan. Along with his immediate family, surviving Bill are his sister-in-law, Rosy Albers, and nephews and their spouses, Mike and Kathy Albers and Mark and Kate Albers and their children. He also has 2 nieces and spouses surviving him, Linda and Larry Horn and Cathy and Carl Ter Haar, not to mention his many dear friends who he valued very much! Bill will always be remembered for his steadfast love of God and Christ, his kind easy-going manner, friendliness, and his love for his family and friends. We hear often what a special and good man he was, striving to honestly live his Christian faith. He stuck to his values and that structured his life all the way through his God-given 92 years. Visitation will be held on Friday, April 19, 2019 from 4:00 to 7:00 p.m. at the Langeland-Sterenberg Funeral Home, 315 East 16th St. in Holland. The funeral service will be held at Trinity Reformed Church, 712 Apple Ave in Holland on Saturday, April 20, 2019 at 9:30 a.m., followed by a luncheon at the funeral home. A military burial service will be held at the Graafschap Cemetery at 640 West 32nd at 2:00 p.m. following the other events. Charitable donations to honor Bill's memory may be made to the National World War II Museum for their expansion project at 945 Magazine St., New Orleans, LA 70130; Trinity Reformed Church's outreach programming; or the Salvation Army's recovery programs. Condolences may be left online at www.langelandsterenberg.com.